Our Creative Engagement programs aim to foster inclusion through creativity, initiative and expression. We believe meaningful creative engagement happens when an individual, groups and the local community participate in an exchange of ideas, skills and cultural expression resulting in the development of a healthy and vibrant community. 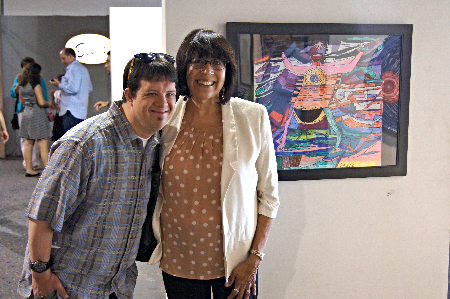 The Exhibitions Department at Able ARTS Work (formerly known as Arts & Services for Disabled, Inc.) exists to showcase the creative work of artists through in-house gallery shows, community exhibitions and sales of artwork to private and corporate collections. We are dedicated to fostering and promoting the work of artists with and without disabilities through an inclusive platform where artists earn a 50% commission on the sale of their work. Our exhibitions include partnerships with artists, organizations and institutions. ARTifact Forum & Gallery is a creative arts exhibition and learning space. This space serves as a public gallery space to showcase art, performance and installation work, where the exchange of ideas and experiences are encouraged. ARTifact also hosts creative arts workshops and offers vocational training opportunities in the arts for individuals with and without disabilities. Workshops are open to all members of the local community for a small materials fee. September 8, 2018. Hear Our Voices is an exhibition created to discuss inclusion, intersectionality and identity of groups historically excluded from mainstream societies. The Go! Store, is a shop of handmade wonders where Able ARTS Work's (formerly known as Arts & Services for Disabled, Inc.) resident artists earn an income from the sale of their one of a kind wares. Our items are inspired by the simplicities in life. From a love-filled crush to a color obsession, each item often has a story behind it. The Go! Store is also a vocational program that enables resident artists at Able ARTS Work (formerly known as Arts & Services for Disabled, Inc.) to acquire product development and basic small business skills. Come to The Go! Store, www.gostore.etsy.com or visit our shop at Crafted - at the Port of Los Angles, booth #173 Friday/Saturday/Sunday 11:00 - 6:00pm. ArtBeat Radio (ABR) is an experiment in social media and broadcasting from Gardena, CA. Working together, the student-comprised staff of ABR brainstorm different multimedia experiences, each of which explore a different topic. Students enjoy creating many different types of pieces, including video, original songs or poetry, podcasts, and more! The goal of ArtBeat Radio is to explore the myriad ways in which the students of Able ARTS Work (formerly known as Arts & Services for Disabled, Inc.) can make their unique voices heard by engaging the ever-expanding virtual world. In partnership with REMO, Inc Able ARTS Work (formerly known as Arts & Services for Disabled, Inc.) offers wellness instruments developed specifically to aid as a tool for special needs populations. These instruments have been developed with input from music therapists, clinicians and other educators that want adapted instruments to further access their student and clients’ greater health, therapeutic benefits and learning outcomes. Your purchase of NSL Comfort Sound Technology instruments supports Able ARTS Work (formerly known as Arts & Services for Disabled, Inc.) programs and services. 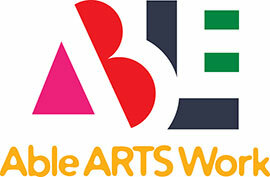 Able ARTS Work (formerly known as Arts & Services for Disabled, Inc.) is a proud REMO Recreational Music Partner offering inspiring music-making activities year after year. For 20 years REMO, Inc. has created rhythm tools that anyone can use. East to play, colorful, durable and designed with you mind!